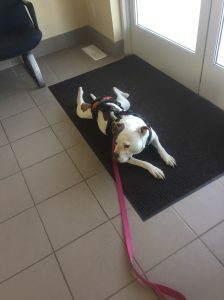 Patches is an approximately 10 -11 years old, spayed female pit bull mix. She suffers from severe bilateral stifle and elbow arthritis. She has had surgery on both stifles. The surgery on her right stifle for cranial cruciate (CrCl) instability was done prior to arrival at the shelter. The surgery on her left was done after intake by a local surgeon for luxating patella and CrCl instability. Upon intake she had mild incontinence, which was well controlled with Incurin alone for some time. In the last several months this incontinence has worsened to the point of needing Prion as well as Incurin. She has a history of recurrent urinary tract infections but has recently cultured negative. She is on many medications for pain relief, joint supplementation, and incontinence (see below). Besides these issues, her lab work shows the very early stages of kidney disease, and she was unable to tolerate Rimadyl. She does have a grade 3/6 heart murmur but has never shown signs of heart disease. Summary of diagnostics to follow. Despite these issues she is otherwise a happy and very well – loved shelter member. Current medications and regular therapies: Gabapentin 200mg PO TID, Tramadol 50mg PO BID, TRP TriCox 1 PO SID (glucosamine supplement), Adequan inj 1ml IM monthly, Galliprant 60mg PO SID – started on 6/8/18, Incurin 1mg PO SID, Proin 50mg PO BID – increased to TID 6/18/18, rehabilitation therapy at Cascade Hospital for Animals once monthly, laser therapy bilateral elbows twice weekly, laser therapy bilateral stifles twice weekly – started on 6/8/18. Laser therapy using Cutting Edge class 4 laser and standard settings (done by shelter staff technicians). Western PE revealed: mild to moderately worn teeth, previous extractions, eyes and ears clear, grade 3/6 heart murmur, lungs normal, abdominal palpation normal. Scars on stifles noted. Myofascial and further PE revealed: Posture is grossly abnormal with kyphosis of the cranial thoracic region, lordosis of the caudal thoracic thru mid-lumbar area, and kyphosis again of the mid to caudal lumbar region with a noted dorsal pelvic tilt. Tail is noted to be carried downward and tends to swing to the left while walking. Both forelimbs are abducted. Patches appears unable to fully sit with stifles flexed and at times stands/sits with hocks touching the ground. Patches seems most comfortable laying on her side than sitting, laying sternal, or walking. Lameness to varying degrees is noted of all four limbs, but more pronounced on the right front and right hind legs. Moderate muscle wasting noted over most of her body, but more pronounced over both hips and hind limbs. Tension of lateral cervical muscles, but good ROM of head/neck. Pectoral muscles surprisingly only mildly tender. Both elbows palpate thickened with decreased ROM, especially on extension with the left elbow and flexion of the right elbow. Pain on palpation around biceps tendon insertion on the left elbow. Taut bands noted in triceps muscles and mild sensitivity on palpation of latissimus dorsi bilaterally. Noted moderate pain response on palpation around BL 18 thru BL 20. Severe buttressing, scarring of both stifles, with very limited range of motion (ROM) – noted crepitus on flexion/extension with firm end feels. Both tarsi have decreased ROM, with the left being more restricted than the right. Noted moderate general sensitivity when trying to palpate hind leg muscles with generalized twitching. Both gastrocnemius muscles noted to have taut bands. Neurologic exam was somewhat limited with extent of orthopedic disease. The severe changes to both stifles and relevant anatomy made locating the patellar tendon difficult, and I was unable to produce a patellar tendon response. Sciatic reflexes intact, but possibly mildly decreased. No crossed extensors. See below for summary of diagnostics she has had over the years. Imaging: Abdomen ultrasound – unremarkable, normal adrenal glands; Summary of radiographs (she has had many over the last 3 years): severe degenerative changes and scaring to both stifle joints. Pins in the left stifle post patellar luxation and CrCl repair noted. Marked to severe degenerative changes to both elbows with the left more so than the right. Spondylosis of mid thoracic vertebra with subjectively narrowed joint spaces. Mild cardiomegaly noted. 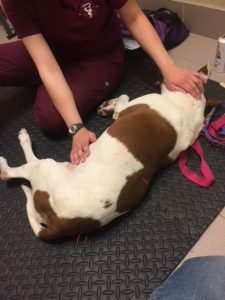 Patches is a great patient in that she has many different areas to treat, but this also makes her a challenging patient. Due to the chronicity of her disease, she will likely need more treatments than a more acute patient to see results. Goals of treatment are to improve posture/gait, improve incontinence, and make her more comfortable. Starting out with 5 – 10 needles attempting to get the most out of our treatment and introduce her to acupuncture is best, while adding in more needles and possible electroacupuncture as tolerated. I will decrease sympathetic tone with autonomic points, while also helping to calm her during treatments. BL points will be used as central points to neuromodulate the spinal cord to help decrease pain centrally and stimulate sacral spinal nerves to improve incontinence. Peripheral points will be chosen to help treat local pain, but also to encourage nervous system connections between peripheral nerves and the spinal cord. In the hindlimb we will also want to target peripheral points that stimulate the tibial nerve as that has been shown to help with incontinence. Lastly, local myofascial strain patterns will be addressed by dry needling taut bands and any trigger points. First treatment – 6/8/18 – Patient was most conformable laying on her side, so it was decided to treat mostly the left side today. Points selected include: GV14, BL 14 bilaterally, BL 20 on the left side, BaiHui, GB 21 on the left side, BL 27 on the left side, BL 40 on the left side, LU 5 on the left side, and a trigger/tender point in the left triceps muscle. Red Seirin (0.16mm X 30 mm) needles were used. Dry needling and massage were our only techniques used during treatment. Needles were placed slowly over about 20 minutes with breaks in between for gentle massage. Ended exam with gentle massage for a few minutes as tolerated. Patches got up when she had had enough. Rationale/goals for point selection: GV 14 – good point to test how patient will respond to acupuncture, calming point, autonomic point to reduce sympathetic tone, neuromodulate the spinal cord (NTSC) at the level of the forelimbs to help with forelimb pain; BL 14 bilaterally – NTSC to help with forelimb pain; BL 20 – chosen as a point distal to BL 18 (where she was quite painful) that might be better tolerated than BL 18 to NTSC and treat painful epaxial muscles – point was still quite reactive, so did not needle BL 20 on the right; BaiHui – autonomic and calming point similar to GV 14, NTSC to improve pelvic limb pain; GB 21 – reduce tension in caudal cervical muscles; BL 27 – stimulate sacral spinal nerves to improve incontinence, and NTSC to help with pelvic limb pain; BL 40 – stimulate tibial nerve to improve incontinence, treat local stifle pain/pelvic limb neurologic dysfunction; LU5 – treat local elbow pain (tender point here at biceps insertion); taut band in the left triceps muscle – treat local myofascial strain patterns. Ten needles were my limit for her today, and though she was tolerating things well, it was clear she was definitely reaching her limit for stimulation. Second treatment – 6/15/18 – Patches recheck PE was similar to last time. Today she was more comfortable laying on her left side with her right side up. Red Seirin (0.16mm X 30 mm) needles were used. Dry needling and massage were our only techniques used during treatment. Points selected included: BL 13, BL 15 and BL 28 all bilaterally, GV 14, BaiHui and BL 40 on the right side, and an attempt at needling a trigger point in the right triceps muscle. Rationale for treatment: GV 14, BaiHui, BL 40 on the right – similar reasons as first treatment; BL 13 and BL 15 – NTSC at a level to help with forelimb pain, treat local muscle tension; BL 28 – after reviewing my notes I realized BL 28 is the back shu point for the bladder, not BL 27 –improve incontinence and to NTSC at a level to treat pelvic limb pain; attempted to needle taut band in the right triceps muscle – treat local myofascial strain patterns – insertion went well, but further stimulation was much too painful – removed needle, did not insert any further needles. Remaining needles were kept in place for a total of about 20 minutes with massage. After removing the needles, gentle massage of mostly the right side was performed for about 20 minutes, which she seemed to enjoy. Noted that a very light tapping motion was what she seemed to enjoy/tolerate the most as any longer strokes or cross friction massage was too uncomfortable (would cause generalized muscle twitching). I also did some muscle spindle cell work on epaxial muscles. 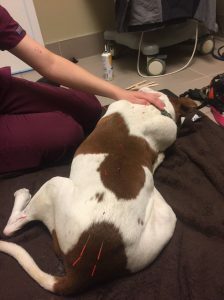 Other notes: Patches did start receiving additional laser therapy of her stifles and has had two treatments since our last visit (done by shelter technician). She also was started on Galliprant last week and her Proin was increased to TID. Third treatment. – 6/22/18 – Patches recheck PE was noticeably improved from last visit. She was significantly less responsive to touch in general over most of her body and was much more comfortable with massage and acupuncture. Her gait also appears to have improved, with more fluidity of movement, less kyphosis, and a less noticeable lameness. It was also of note that she chose to lay sternal today rather than on her side. Points selected were: GV 14, SP 6 on the left, BaiHui, BL 13, BL 15, BL 18, BL 21, BL 27 and BL 28. All BL points were used bilaterally. Red Seirin (0.16mm X 30 mm, and 0.16mm X 15mm) needles were used. 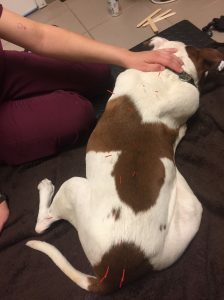 Dry needling and massage were our only techniques used during treatment. For GV 14 and SP 6 15mm length needles were used. Needles were in place for about 20 minutes. 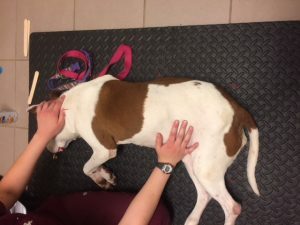 She was massaged for about 20 – 30 minutes following treatment. She thoroughly enjoyed her massage today, even leaning into some areas, which was very different from the last two treatments where only the lightest touch massaging seemed to be comfortable. Rationale for treatment: GV 14, BaiHui, BL 13, BL 15 – similar to previous treatment; BL 18 and BL 21 – NTSC and treat local pain – was finally able to needle these points comfortably today; BL 27 and BL 28 – similar reasons to previous treatments, but used both today to try to stimulate sacral spinal nerves as much as possible and treat pelvic limb pain – as she was sitting sternal (hind legs were a bit underneath her) access to distal points was a bit limited; SP 6 – stimulate the tibial nerve to help with incontinence, treat local pain in gastrocnemius muscle and maybe stifle pain as well – chosen over SP 6 as it was more accessible. Note: Today I used a tubeless insertion technique with her to see if this was preferable, and it was noticeably better tolerated. This could also be due to her feeling more comfortable, but I suspect she appreciates this method over the tubed insertion and will continue to use this in future treatments. Fourth treatment – 6/29/18 – Recheck exam today revealed she was somewhat more reactive to touch today than at her last treatment, but not as much as before we began treatments. She is still reactive in many of the areas that were noted previously. Her gait today appears to be somewhat worse as well, with a lameness that appeared to be similar to her first visit. She did lay sternal for some time but preferred to lay on her left side today. Points selected: GV 14, BL 15, BL 17, BL 21, BL 22, BL 28, unnamed bladder point around L4, BaiHui, GB 21 on the right, LU5 on the right, SP6 on the left. All bladder points were used bilaterally with a tubeless insertion method. Red Seirin (0.16mm X 30mm) needles were used today. Dry needling and massage were our only techniques used during treatment. Needles were in place for about 20 minutes. Massage was a bit shorter today, with a gentler technique. Rationale for treatment: GV 14, BL 15, BL 17, BL 21, BL 22, BL 28 – all similar reasons to previous treatments – NTSC and treat local pain, treat incontinence; LU 5 – treat local elbow pain – showed tenderness to palpation; SP 6 was chosen on the down leg as SP 6’ seemed a bit sensitive today on the up leg. Today we went after more bladder line points to try to further NTSC as she seems to be having a bit of a setback. Patches was a challenging case from the start. I was encouraged by the improvement in how clearly much less reactive to touch she was at our third treatment but was also discouraged by how she seemed to have a setback in our fourth treatment. I do believe her improvement was from acupuncture as the only change to her medications was including Galliprant. By week three when she was improving, she had already been on this for 3 weeks. She did tolerate acupuncture fairly well but had I more options I would likely have treated her a bit differently. Ideally, in the beginning I would have done treatments more frequently (2 – 3 times as week) with more laser therapy. As she became less painful and even more accepting of acupuncture, I would like to have tried electroacupuncture, especially for her incontinence. 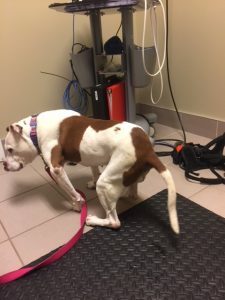 I didn’t really feel like I could get a great treatment for her incontinence because her orthopedic pain was so great, she would only allow so many points in her hind limbs/pelvic area. The environment she lives in makes it difficult as well, as she spends most of her time on a concrete floor. It kind of felt like we were starting afresh every week instead of making lasting progress. I truly wish I could have continued her treatments longer, and was planning to do so, but for different reasons I haven’t been able to get out to see her since. I’m hoping in the future to go out to see her as she was a wonderful patient and despite all her issues was a really happy, special girl. I feel as if I could have, and still could, do more for her. JAMA. 2017 Jun 27;317(24):2493-2501. Effect of Electroacupuncture on Urinary Leakage Among Women with Stress Urinary Incontinence: A Randomized Clinical trial. Liu Z, Liu Y, Xu H, He L, Chen Y, Fu L, Li N, Lu Y, Su T, Sun J, Wang J, Yue Z, Zhang W, Zhao J, Zhou Z, Wu J, Zhou K, Ai Y, Zhou J, Pang R, Wang Y, Qin Z, Yan S, Li H, Luo L, Liu B.
Curr Urol Rep. 2017 Jun;18(6):47. Physical, Complementary, and Alternative Medicine in the Treatment of Pelvic Floor Disorders. Arnouk A, De E, Rehfuss A, Cappadocia C, Dickson S, Lian F.
J Pediatr Urol. 2018 Jul 19. pii: S1477-5131(18)30346-2. Evaluation of applying Kinesio taping in children with urinary incontinence. Krajczy M, Luniewski J, Bogacz K, Szczegielniak J.
I just thought this last article was interesting. Would be neat to try this in veterinary medicine!